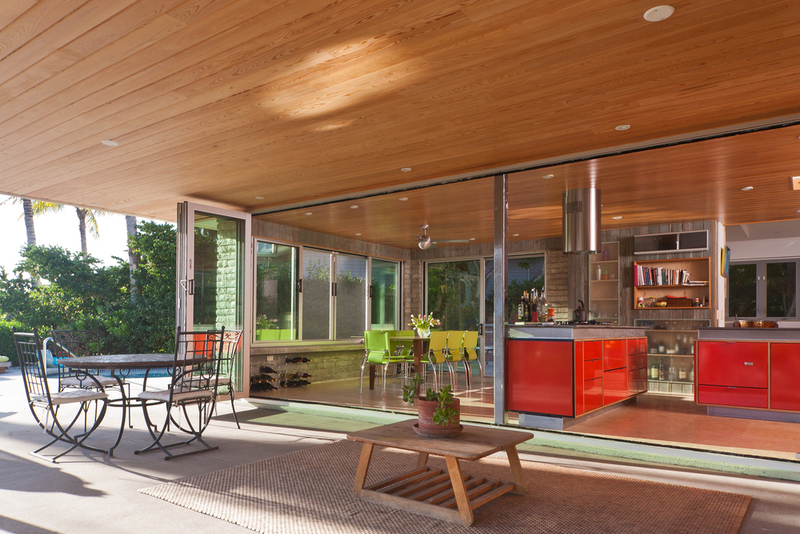 The house, constructed in 1950, was composed of a single story element that collides at an acute angle with a two story element containing the garage and master bedroom. 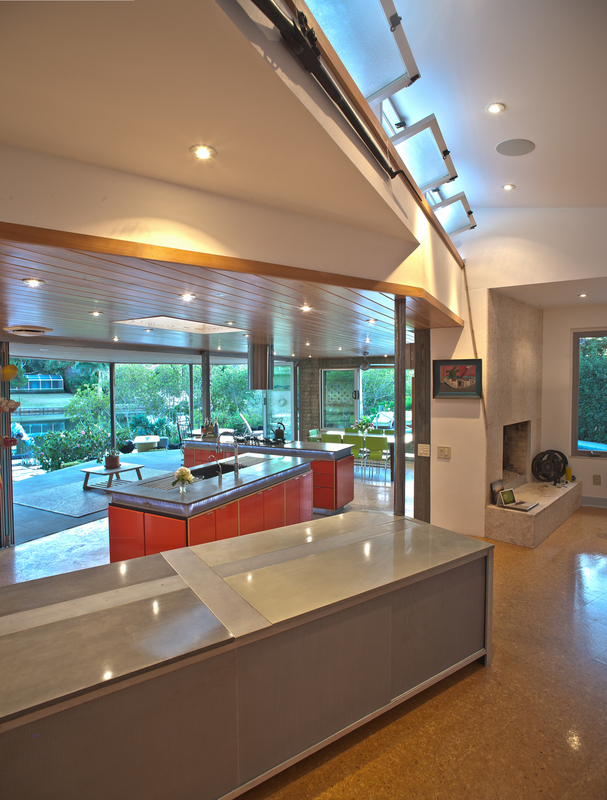 The original living/dining space was designed as a large singular space with a single vaulted ceiling that contains operable transom windows used for natural ventilation purposes. Spaces along the water side of the living/dining room were compartmentalized into support spaces, a kitchen with a small window looking out to the water and a small screened patio looking over the kidney shaped swimming pool—turning its back to the most valuable asset of the property—Hudson Bayou. As the client enjoys boating, cooking and entertaining- the renovation project would involve opening up the water side of the residence by demolition of existing masonry walls and the addition of steel columns that allowed for an impact resistant wall of glass accordion doors that slide away and open the kitchen onto a new covered patio space looking out over the water. By opening the plan up, the designers were able to link the open kitchen plan onto the exiting living room space—allowing for views from the major spaces in the house that previously were blocked from water. The eccentricity of the acute angles in the house plan provide for dramatic geometries to which additional natural light was introduced into the main living area through a triangulated skylight that serves to accentuate the house’s original parti. As a result, the house completely opens itself up to the beauty of Florida living.